This versatile work platform can be usedfor many different big and small household projects and is so durable. Whateverthe task, cleaning windows, painting, or repair projects it will provide youwith many years of use! This platform make household tasks less of a chore.Extra large steps provide stable footing and the lightweight design makes themeasy to carry from room to room. 【Anti-Slip Pedals & Padded Top Platform】-- This Giantex step ladder has 3 padded platforms, which makes your foot or knees more comfortable and safety. The size of the stepper: 15.0"L x 10.2"W.
【Easy-to-Hold & Foldable Ladder Design】-- The foldable design is very convenient and would not take much room to storage. Overall dimension: 17.9"W x25.6"D x40.6"H.
【Solid & Anti-Rust Ladder Structure】-- The Heavy Duty 3 Step Ladder is structured for safety with good weight capacity, and 4 covers on the 4 legs could prevent hurting the floor. 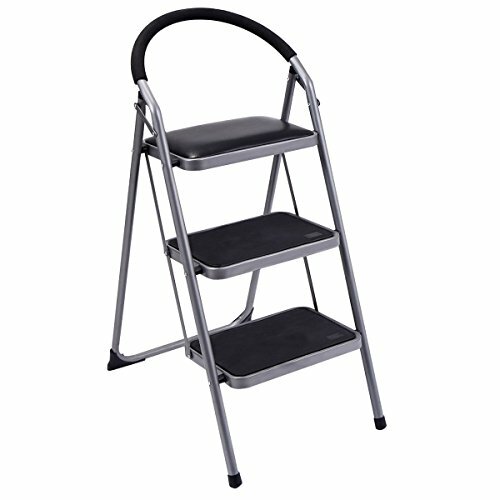 【Anti-Slip Foot Covers & Protective Handrail】-- Strengthening treads, anti-slip steps and non-slip end caps keeps the step ladder gripped firmly on its feet. Anti-slip handrail is easy to hold and protects you well while you are working. 【【100% Satisfaction Guaranteed】-- We would try our best to give you satisfied shopping experience, if there is quality, we would make best solution to solve the problem.